pa is a Japanese brand that makes cute nail polishes and nail products. Their website has detailed product information. They have a ton of colors to choose from especially the glittered ones are super cute. I think every girl should at least own one bottle. 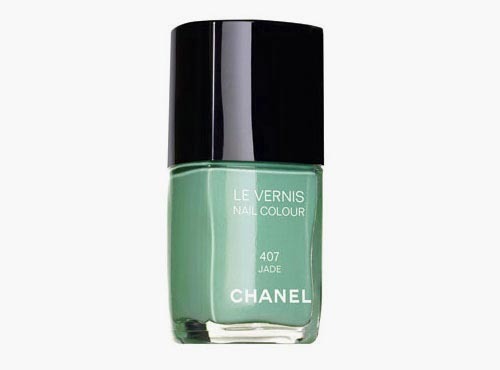 I picked up this color because it’s very similar to Chanel’s 407 Jade from Fall 2009. I wouldn’t say it’s identical but rather pretty close. I like Jade but ended up not getting it. I used to be very crazy about Chanel’s nail polishes but they always chip on me. So now only when something really unique come up, I’d pass. Picture from Chanel. 407 Jade seems a tad greener. The packaging is really simple and it’s so small, probably half size of a Lunasol nail polish. It sells for only ¥294. 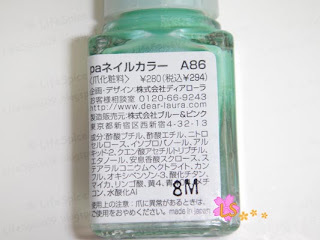 I think the pa polishes are generally on the sheer side. I tried doing 2 coats and it wasn’t yet opaque. So this is how it looks with 3 thin coats. 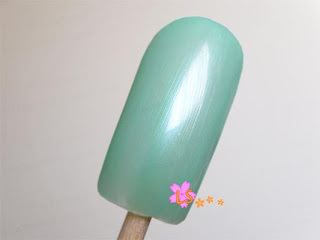 The trick is always do thin coats and let dry before putting on another coat to avoid bubbles. I would have to say the pa polish won’t be as great as Chanel’s even though I don’t have a comparison. They’re more water-y and not totally streak free. But still the color itself is well worth it. That's a gorgeous color. Love it! And I really like PA nail colors. I have one in a shimmery pink color and I always use it. I have the PA glitters, they are really pretty. I love this color, I think I might get it soon! Thanks, LS!